Here are 6 reasons why you should learn First Aid. Everybody knows that the future is uncertain. An accident can happen at any time, in any place. A quick look at our recent news itemshighlights the everyday nature of accidents that occur in our lives. You could be at home, playing sport, driving in your car or at work when misfortune may strike. Every year for example, over 640,000 people experience at least one injury or illness at work (ABS 2011). Some of these injuries can be quite serious and include fractures, crush injuries and wounds. Accidents can and do happen to ordinary people and usually when we least expect it, so It pays to be prepared with First Aid training. Injuries and illness don’t just occur to strangers. Every year over 20,000 people die in Australia from heart disease including heart attacks and angina (ABS 2012). 80% of cardiac arrests occur in the home or a domestic setting (HSF 2012). It is more than likely that if you are required to perform CPR, you will be performing CPR on someone you know. That casualty could be you partner, parent, child or friend. 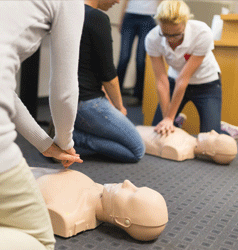 First Aid training will provide you the ability to give your loved life-saving First Aid.l. The first few minutes following an accident are crucial. The treatment a casualty receives in this time can often affect their outcome. Sometimes it can mean the difference between life and death. The statistics for cardiac arrest don’t lie. Sadly, the average survival rate for someone that has a cardiac arrest out of hospital, is only 5-10%. However, if a patient receives immediate and quality CPR and defibrillation, their chances of survival can be improved dramatically. In some cases, early CPR and defibrillation can produce survival rates as high as 75%. (ERC 2010). First Aid training can prepare you to provide these life saving techniques and improve the outcomes for someone that has been injured or fallen ill.
Learning First Aid can also improve your overall employability and job prospects. In NSW and other Australian states, legislation such as the Work Health and Safety Act 2011 and the Code of Practice: First Aid in the Workplace. can require workplaces to have employees that are trained to administer First Aid. As such, these workplace First Aiders are required to complete a nationally accredited training course like the Provide First Aid. By completing First Aid training, you can improve your opportunities in securing a new job or meeting the requirements of an existing position that may require you to have these qualifications. The response time in First Aid incidents is often critical. Many acute illnesses and injuries require immediate care. Whilst having resources such as a First Aid manual is a great idea, in an emergency there is often little to no time to read these First Aid instructions. With First Aid training,you have committed these life saving steps to memory. You have the skills and knowledge to be able to react quickly and efficiently in the event of an emergency. First Aid training allows you to deliver effective and immediate First Aid. In an emergency people often fail to provide adequate care for a casualty. Some people when faced with a crisis often are overcome by fear and anxiety and may panic. Bystanders to an accident can have fears that they may do the wrong thing, cause further injury to a casualty or be harmed themselves, such as catching a disease. These reactions can often result in a delay in a casualty receiving the necessary treatment or the quality of the treatment being compromised. First Aid training can provide the opportunity for people to learn exactly what to do and be able to overcome any of these fears. Such training will enable someone to be able to react with greater confidence, composure and self-assurance in the unfortunate event of an emergency.